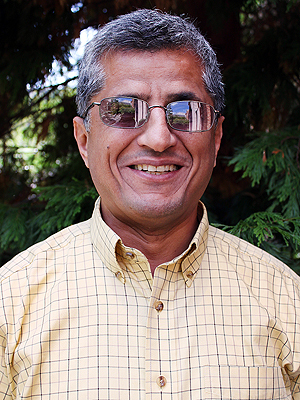 Hi, my name is Hadi Rangin, and I am the new information technology accessibility specialist for Accessible Technology Services (ATS), which includes the Accessibility Technology Center (ATC) and DO‑IT. My main focus in working with DO‑IT is to promote accessible design for students across the nation, and working with staff, developers, administration, and technology vendors to do so. I am originally from Iran, but I moved to Germany in 1986. I studied computer science, with a focus on network management at Karlsruhe University. After I immigrated to the United States in 1994, I began to focus on human-computer interfaces at Oregon State University (OSU). I earned a master’s degree; part of my studies translated into accessibility issues. I am blind, and this made a lot of my studies complicated since computer science is so math based, and math is still an area where we do not have great accessibility. But it also gave me a lot of passion to study harder and work through the accessibility problems. While part of the OSU accessibility team, I met Sheryl Burgstahler, right after she had started DO-IT. After graduating, I began working for the University of Illinois in technology accessibility. Recently, I discovered a position opened at DO-IT, and I was eager to work with Sheryl, whom I have now known for over twenty years. At the ATC, one of my main missions is to identify potential accessibility issues on campus and promote the creation of new software developed with universal design in mind from the ground up. This is a huge issue to tackle, since it takes so many people, new ideas, and a lot of time to tie together knowledge of the issues and expertise in technology design. One of the main accessibility issues is the lack of computer programs that are completely accessible by keyboard. Designers so often leave out important functions in favor of the mouse, which just isn’t usable by a wide variety of people with physical or sensory disabilities. Another accessibility issue we have tried to tackle is the lack of structure in web products and programs. Users often have issues finding important information or even how to use these programs. I rarely have free time, but when I do, I often talk with my wife and daughter, whom have not yet moved to Seattle. I used to often enjoy swimming and biking, which I hope to get back to whenever I have time.